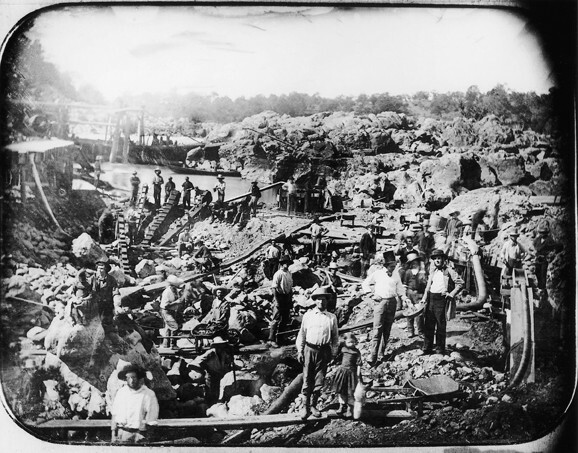 OLD MINE RIVER: Miners at work on the American River, 1852. 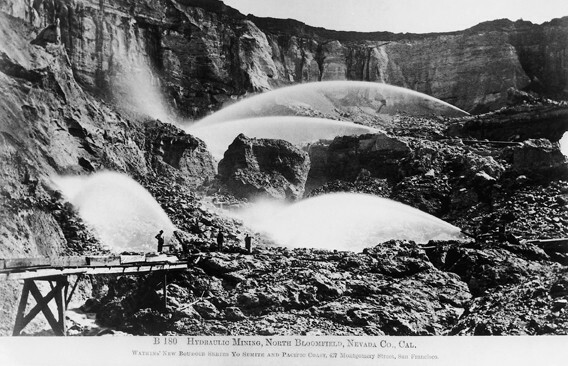 Developed in collaboration with the Oakland Museum of California, Gold Fever! is a statewide exhibit designed to be adaptable to local connections. At the adobe, the visitor is immediately presented with these connections, especially those of the Tognazzini family. Point Sal, east of the Tognazzini homestead, is one of the few places where gold was mined from the beach. Dan Tognazzini, 16 years old in 1897, comes into some “portable property” from a beachside mining operation—I won’t spoil this great anecdote; you’ll just have to go to find out—with which the homestead is constructed. Provided by Herbert Tognazzini, this is the best kind of local history: the kind that makes real connections to major events without resorting to petty egoism or suspension of disbelief. SCORCHED EARTH: Later large-scale mining efforts included such destructive methods as this hydraulic mining operation in North Bloomfield, Nevada County, Calif., circa 1870. “It was a pivotal time for the culture of California,” says Executive Director Marina Bobadilla Washburn, who guides us through the exhibit and expands upon these local connections. Captain Dana’s cattle, valued for their hides and tallow at $8 a head prior to ’49, are suddenly in demand as food for the miners in a “cattle boom” that increased prices to $85 to $95 a head. The Danas drove this bovine gold from Nipomo up to San Mateo, where the San Francisco buyers would take over the delivery. At the heart of the exhibit lies the USS Edith, a ship run aground “near Point Aguino,” which Juan Francisco Dana’s writings tell us was purposefully destroyed and abandoned in pursuit of gold; presumably the crew thought they were closer to gold country than they actually were. When they inevitably passed “Casa de Dana” on the way north, Captain Dana purchased the wreckage, from which he salvaged his parlor table and, possibly, building materials for construction of the adobe’s second story. The statewide points of interest are no less intriguing for the local spin, though perhaps more familiar: the influx of commerce to San Francisco; tensions among the various races, classes, and creeds of people who came to seek fortunes; the environmental devastation wrought by dredge and hydraulic mining. But stories like those of the Edith and Dan Tognazzini are the little sparks that illuminate the exhibit under the roof of “Casa de Dana”—a light by which to read the pages of history. 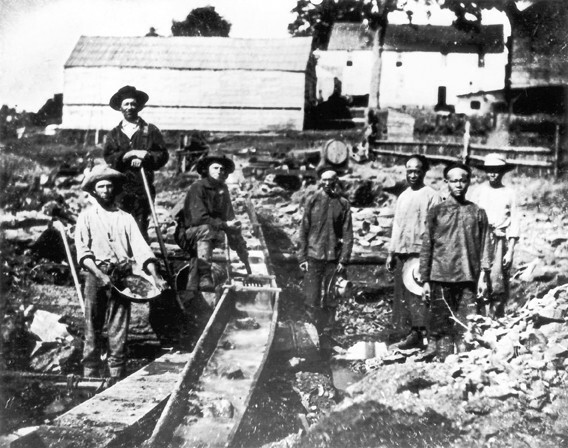 STAKE YOUR CLAIM: Miners at work near Nevada City, 1852. From “La Sala” we enter the master bedroom, complete with Eastlake bedstead, and pass through the girls’ room (originally built with one small window, too high for egress). We emerge at what seems like the back of the adobe, but was actually its front entrance. The property overlooks the creek and Thompson Avenue, which used to be the main highway where mail carriers met between Los Angeles and San Francisco. The Dana Adobe was the first mail stop in the county, Washburn tells us, where locals would come to read each others’ mail before the main post office was moved to San Luis Obispo in the early 1950s. After that, apparently, the fun was over. RUSH, DON'T WALK: Gold Fever! Untold Stories of the California Gold Rush is on view through June 28, Saturdays and Sundays from 1 to 4 p.m. or by appointment, at the Dana Adobe, 671 S. Oakglen Ave. in Nipomo. Heritage Day—including pony rides, panning for gold, and other demonstrations—will be on May 24 from 10 a.m. to 4 p.m. For more information, call 929-5679 or visit danaadobe.org. There’s a light breeze, but the sun is warm and the view is magnificent. The tour is over, but Washburn invites us to spend as much time as we like in the exhibit on our own before graciously retreating. Standing on Captain Dana’s front porch, gazing out at his hills, it’s easy to forget when you are. We begin making plans to drive another herd of cattle up to San Mateo as we hear, somewhere in the distant future, Washburn greeting the next visitor at the door. Arts Editor Erin C. Messer lost her last pinch of gold dust at the monte table at “Casa de Dana;” send your leads on mining claims to emesser@newtimesslo.com.